High school students, local musicians and other lucky fans were treated to a session recently with Australia’s most popular electric roots/jam band, the John Butler Trio, at the CDU Alice Springs campus. 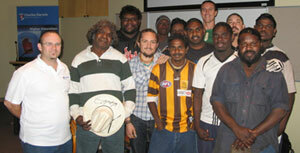 The group, currently on a national tour, accepted an invitation by CDU Music Lecturer Cain Gilmour to visit the campus and engage with local youth. 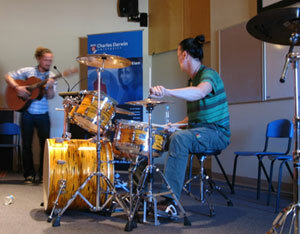 Invited musicians, high school music students and members of the Santa Teresa community packed the new higher education lecture theatre to hear the stories and experiences of singer John Butler and drummer Michael Barker. The two-hour session was driven by the audience quizzing the pair on their experiences, motivations and aspirations. Conversations covered political thoughts, song writing, travelling trials and tribulations, venue and events experiences, and the realities of touring, money and industry professionalism. Students clearly enjoyed the session learning, first hand, the enormous sacrifices and commitment needed to work in the industry. John Butler’s advice to budding musicians was simple. ”A relationship with the audience is the most important thing and you only create that by working your guts out,“ he said. ”And we work really hard because we believe in the music." The audience was then treated to an impromptu performance of “Zebra”, the band’s current signature track. It was a class performance with John Butler singing through the lectern microphone backed by Michael Barker on drums. Charles Darwin University, Centralian Senior Secondary College, Anzac Hill High School, Our Lady Sacred Heart and the community of Santa Teresa thank the duo for their efforts.